A theological resource on the doctrine of Scripture for Christian thinkers and church leaders. And then discuss Primer with others. Study it with your elders or church leadership team, your ministers’ fraternal or homegroup leaders. Invite a group of potential leaders in your church to get together and read an article at a time. 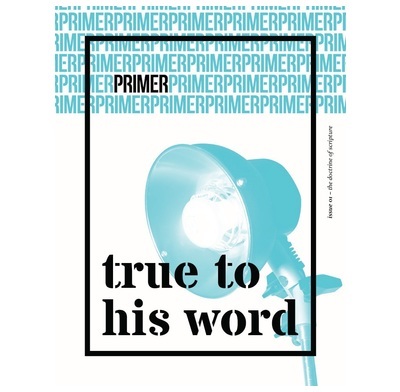 Primer is published twice a year and issue 01 is on the doctrine of scripture. In it we map the current debate and outline the contemporary challenges to the Bible’s authority coming from inside and outside the church. We look at the inerrancy of scripture with FIEC National Director John Stevens while Fred Zaspel annotates a classic text on the inspiration of scripture from B.B. Warfield. The Canaanite genocide is often cited in these debates as an argument against the moral authority of the Bible, so Dave Puttick explores this for us in detail. The last couple of articles by Dan Strange and Ralph Cunnington explore how we can better communicate the doctrine of Scripture in our evangelism and our teaching. Why not pick up a copy and join the conversation at Primer HQ as we discuss the doctrine of scripture. I find it hard to encourage our elders and lay leaders to think carefully through theological issues relevant to church life. Primer fills that gap. It’s well designed, insightfully written, and I’m sure it will prove invaluable in both supporting current leaders and training the next generation of leaders in our church. Primer has definitely proved good to it's name as we have prepared for that. Not only does it lay a solid foundation it has been tremendously helpful in giving an overview of some of the current debates as well as the issues and objections that we and our church members are likely to face from the world around us. I'm not aware of anything else that does this all in one place in the way Primer does. Thank you! Reference to and reviews of relevant books has also been really helpful and I'm expecting future issues to be a prompt for extended conversations with elders and leaders within the church as well as a go-to resource in leadership training. Primer is a gift to our church’s weekly reading group! Seven of us meet, ages 70 (ish) to 23, with Christian experience ranging from 50 to 4 yrs, to discuss a book of choice for an hour and a quarter. “True to His Word” is the perfect text for us to explore the Doctrine of Scripture with. It’s entry level for those in our group studying theology as apprentices, but is a great refresher as well as sharpener for those more experienced in the faith. There is a masterful economy in the way Primer is put together. An awful lot is said in a short space, but the text isn’t overloaded, and easily lends itself to discussion. Questions keep the focus on the core matters, and quotations are well-chosen. Both serve to set the issues in their historic and contemporary contexts. The end result is that we’re given a clear appreciation of the Doctrine of Scripture, an awareness of its detractors, and plenty of ideas for honouring the Word in our lives and churches.